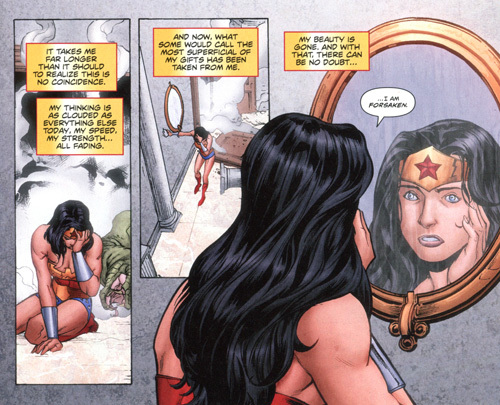 Last Wednesday no fewer than three comics starring Wonder Woman came out. If that’s not worth a write-up, I don’t know what is. I still can’t get used to the blue boots. 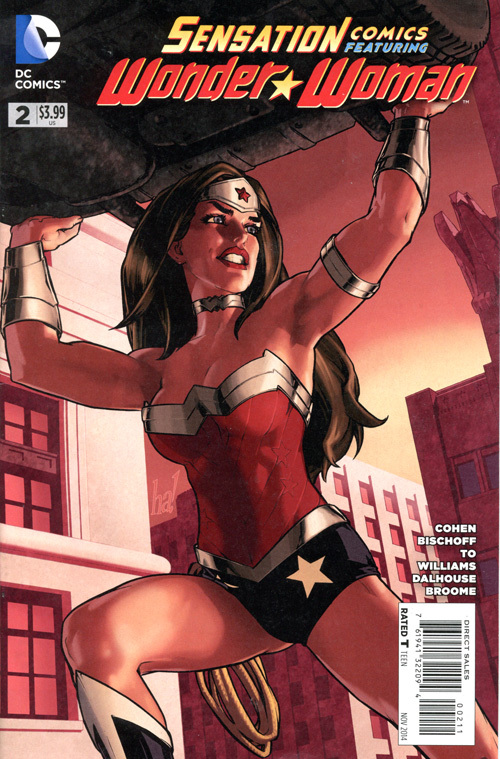 Sensation Comics Featuring Wonder Woman #2, DC Comics, November 2014. Sensation continues to be the best news Wonder Woman fans have had for some time, an anthology comic devoted entirely to WW, regardless of continuity or which version of the character happens to be in vogue at present. I wrote up the first issue a few weeks ago, so let’s take a look at the second! The first story is by writer Ivan Cohen and artist Marcus To, two guys I’ve never heard of. I looked them up, and as far as I can tell Cohen primarily writes comics based on DC animated series, such as Green Lantern: The Animated Series and Beware the Batman, and his bio says he was “previously an editor and media-development executive for DC.” To is a 30-year-old Canadian artist who’s worked on a few of DC’s lower-profile series such as Batwing and Red Robin. 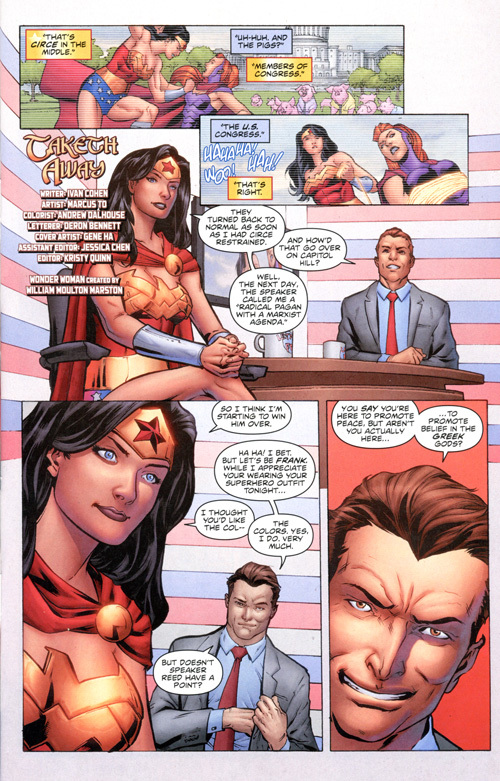 “Taketh Away” seems to be set sometime around Greg Rucka’s Wonder Woman run in the mid-aughts, judging from Wondy’s costume and the fact that she’s the Themysciran ambassador at the time. It opens with a “gotcha” interview by a TV host who accuses her of being essentially a spokesperson (actually he says “spokesmodel”) for worship of the Greek gods. She deflects the question as readily as if it were a bullet, saying that faith is a private thing and she neither denies nor promotes her gods. Jokes at Congress’s expense are always welcome. Yeah, I’m sure that’s what he meant. The tricky part is when she says the gods have even taken away her beauty, and frankly she looks exactly the same as usual. You might think this is just poor visual storytelling on To’s part, and maybe it is. But maybe, just maybe, it’s a clue. If that’s a bad face day, honey, you still got it. It’s a clever story, featuring short battles with Circe, Cheetah and a surprise villain at the end, plus a conclusion that relies on one of her lesser known and often forgotten powers, which she probably doesn’t even have in the New 52. The backup story is by another creative team I’m unfamiliar with, Jason Bischoff and David Williams. The only credits for Bischoff I could find were a few issues of Cartoon Network Action Pack (who knew that was even a comic?). Apparently his main bag is developing and writing promotional copy for toys and collectibles. Primarily a cover artist from what I can tell, Williams drew a few issues of Marvel’s Excalibur and DC’s Jaguar back in the 1990s. I should like their story, “Brace Yourself,” because it’s basically a Wonder Tot tale, about Diana as a little girl. We see her first being given her bracelets by Athena, who at some point became the patron of the Amazons, a place held by Aphrodite in older WW stories. Or rather she’s given one bracelet; the other one she can only earn by defeating her mother. (Obviously this isn’t set in one of the previous continuities in which Amazons went insane without their bracelets.) Anyway, this leads to her continually trying to attack Hippolyta, like Inspector Clouseau’s manservant. 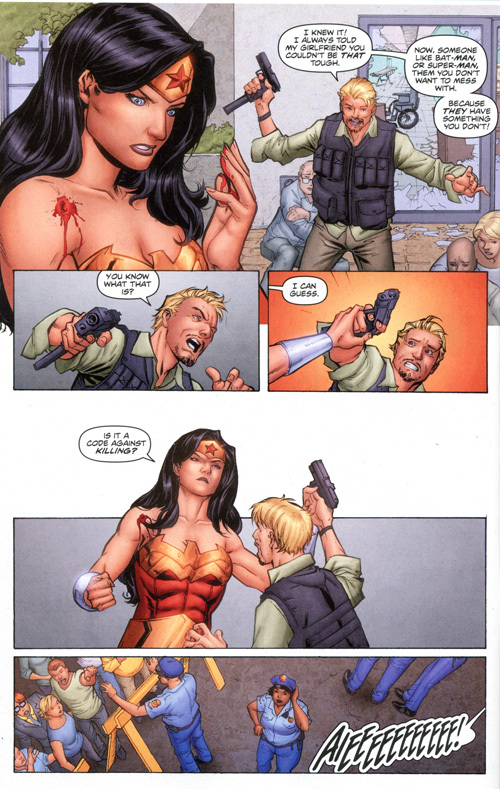 It’s a cute story, all in all, eventually tying in with a variant of Wonder Woman’s well-known origin. The other two WW comics that came out last week were tie-ins with the latest overblown “event” storyline, Future’s End, which as far as I can tell is set in the horrible dystopian future of the DC universe. So of course every DC series has to have at least one special tie-in issue with a holographic cover. I don’t know what the hell the overall story is about, but the Wonder Woman-related issues at least are set five years in the future. Wonder Woman: Future’s End #1, DC Comics, November 2014. I’m at a distinct disadvantage with this issue, because I only read the regular Wonder Woman series in trade collections, so I’m significantly behind. But the important bit is that Wonder Woman has become the god of war, and apparently five years later that’s still true. This issue isn’t written by the regular WW writer but by Charles Soule, writer of the Superman/Wonder Woman series as well as Red Lanterns, Swamp Thing and Marvel Comics’ She-Hulk and Death of Wolverine. The art’s by Rags Morales, who was recently the Action Comics artist but also had a stint on Wonder Woman in the Rucka era. In Wonder Woman: Future’s End, Wondy is leading a rag-tag team of dead warriors from all eras: Vikings, World War I soldiers, Native Americans, whatever. Her generals include Alexander the Great, Napoleon and Boudicca as well as familiar faces Orion and Hades. She sure do fight good. Superman/Wonder Woman: Future’s End #1, DC Comics, November 2014. The Superman/Wonder Woman: Future’s End comic is also by Soule, this time with art by Bart Sears. And in it we learn that all is not what it seems! Superman says he didn’t fall to Nemesis—Wonder Woman did! And now he’s come to Tartarus to rescue her from her crazypants delusions. Whatever it is, it’s totally worth it for those boots. Oh, and while this is Superman, he’s not actually the Superman of this time period but the one from only about a year in our future, gone forward in time to help out because the Superman of this era is a recluse and no help to anybody. I don’t know anything about that because I haven’t (and probably won’t) read the rest of this storyline, so I’ll just have to take his word for that. 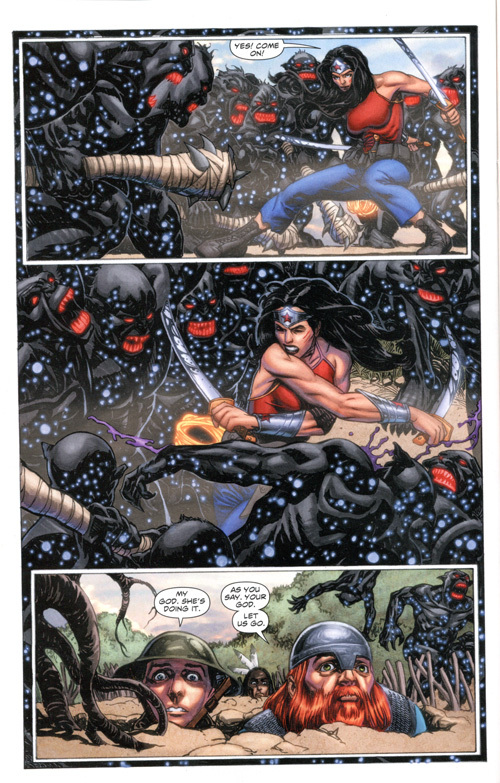 So anyway, now Wondy and her actual army of Amazons have to fight the armies of Nemesis for real, not just in her head. There’s also an allusion to a war between superheroes and the gods of multiple pantheons that’s in Superman’s future but in the past of Future’s End—that is to say, somewhere around two to four years from now. So we have that to look forward to. 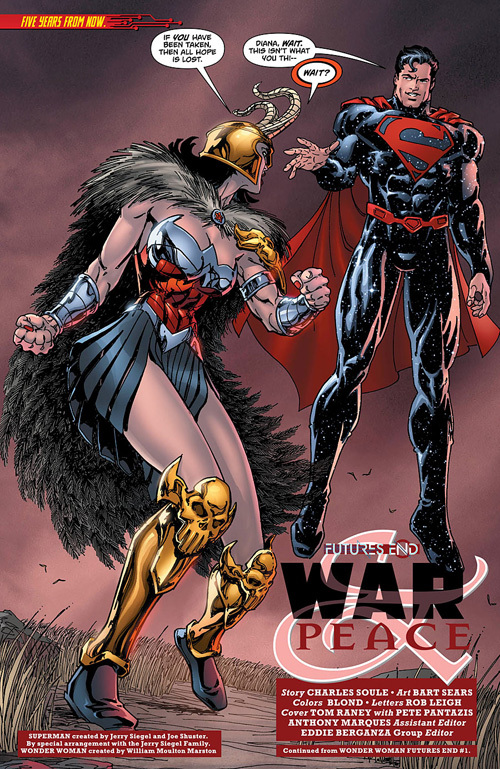 And in the end, Wondy has to somehow reconcile war and peace in order to defeat Nemesis, the personification of enemies. It’s not a bad little story, but it is a very little story, hardly worth one issue, let alone two special issues. It just reinforces what I already know—that these overblown “event” storylines are never worth the money of trying to keep up with them, even enough to figure out what the heck is going on.